The following are stories of work some of our best volunteers are doing, from our annual reporting exercise. Enjoy! Daniel Tobin is an Agricultural Extension volunteer in Bolivia, who is originally from Doylestown, Pennsylvania and graduated from Bowdoin College with a B.A. in Religion. After graduating in 2004, he spent the following two years as an assistant farm manager on a family organic farm in northern Connecticut. 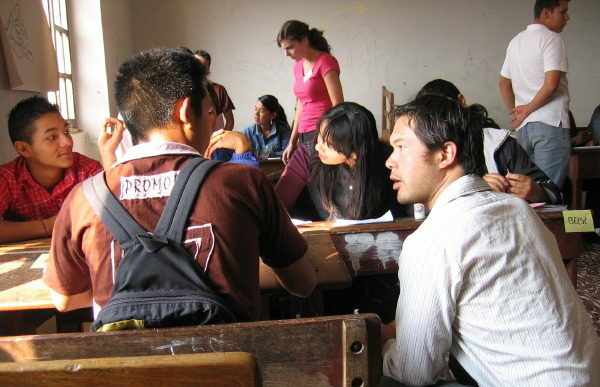 Daniel entered training in Cochabamba, Bolivia in January 2006, and was then relocated to the valley regions of Chuquisaca, Bolivia from April 2006 to April 2008. Daniel’s site, Sopachuy, located within the province of Tomina, sits forty kilometers off the highway from Sucre to Monteagudo. While the town’s population is over 2,000, the entire municipality has over 6,000 residents. Daniel’s service has been dedicated to working alongside a small agricultural cooperative, which supports poor farmers in the area. Upon his arrival, Daniel continued a previous volunteer’s six-month old beekeeping project, which consists of sixteen members, ten of whom share an educational apiary while the other six have hives in their rural homes. After weekly practice sessions and theory classes, as well as three different workshops, the project participants have learned basic beekeeping management so as to produce honey which helps improve health, strengthen and diversify the economy, and increase crop yield through bee pollination. In March and April 2007, the Sopachuy Beekeeping Association harvested for the first time and then marketed and sold the honey for profit. Shifting focus to the sustainability of beekeeping in the area, Daniel now works intensively with three of the most dedicated beekeepers to practice queen-rearing and royal jelly production, two technically advanced but cost effective products from the bee hive. Daniel has led other agricultural projects in the Sopachuy area. He has planted forage crops such as alfalfa with three farmers to help improve soil structure and feed starving cattle in the dry season. He also coordinated a workshop on sprinkler irrigation and helped two farmers purchase and install the gravity-fed sprinkler systems. Additionally, after a Peace Corps fish-farming workshop, Daniel helped facilitate the digging and maintenance of a fish pond, from which the young farmer is now harvesting some of his 800 carp for both sale and reproduction. Christopher Salvagio arrived in Cochabamba, Bolivia for three months of Peace Corps training after having worked four and a half years for a HVAC and Plumbing Contrator in Orlando, Florida. Christopher replaced an excellent volunteer in San Antonio de Lomerío, Steve Lotti, who tragically died in a plane crash only a month after his service had ended. Christopher's first challenge was to relate Steve's passing in a language foreign to him. With the monumental task of finishing Steve's original project with Green Cross Bolivia and an additional Partnership Project Christopher received made of funds donated by Steve's friends and family. These funds were used in order to construct an additional 19, thirteen thousand liter rainwater catchment tanks, as well as, a raw materials bank for the local artesans. Christopher garnered the assistance of nearby integrated education volunteer Lauren Gaudio and with their combined efforts they taught the operation and maintenance of the ecological latrines with a method appropriate for illiterate people, to ensure that they would be used and used effectively. Steve and Green Cross Bolivia's pilot project garnered enough enthusiasm in ecological latrines and tanks that the community agreed to build more by asking the Mayor directly for funds. Green Cross Bolivia separately started another project to build 25 new tanks with a capacity of 10,000 liters in San Antonio and five other surrounding communities under Christopher's guidance and tutelage. Quickly, the first rainwater catchment tanks were built and immediately filled up with water from the reservoir 2.5 kilometers away. Eventually, Christopher's projects received overwhelming success, so much so that the Mayor's office after Christopher's departure continued the rainwater catchment tank project and the ecological latrine project in the municipality that Steve Lotti loved so dearly loved. Environmental Education PCV Ellena Fickett lives and works within the municipality of Yacuiba (pop. 100,000), located in the Chaco region of Bolivia, roughly 5 kilometers from the Argentine border. Her counterpart agency is the mayor’s office. The objective of Ellena’s project, and of the environmental education project within the mayor's office, is to develop environmental awareness and build an environmental stewardship ethic, working alongside teachers, students, technicians, and the local population. Throughout her two-year service, Ellena has become involved in several different aspects of environmental education within Yacuiba. She has worked in over 15 different schools, with both teachers and students, in over 350 different classes, ranging in grades K-8, teaching a variety of basic environmental concepts spanning from waste management and contamination to conservation techniques and basic nutrition. She has applied both formal and non-formal education techniques, using visual aides, games, activities, and homemade cookies to try to offer the most active learning experience possible. Apart from the activities within the classroom, Ellena has formed three separate Eco-clubs. The groups are each 30-34 students ranging in ages from 10-14. They meet five times a month, and have been involved in activities such as trash collection, recycling, tree planting, and a local environmental awareness campaign. Ellena has also taken part in many classes at the local English Learning Institute in Yacuiba and holds monthly meetings with the teachers to keep up their level of English. During June of 2007, Ellena also organized and ran an Environmental Fair on Earth Day. Over 15 different schools participated in a range of activities such as an essay contest, a costume contest, a chalk-mural contest, and a speech contest on five separate themes. There were over 450 student participants, and 600 attendees to the Fair, and it is now set to be an annual event. A result of the fair has been the instigation of a pilot-recycling program in five schools. All gains from the sale of recycled trash have gone to the schools to purchase new books, soccer balls, and other education materials for the students. Ellena has overseen the entire recycling process from locating a company to purchase the trash, finding a site for the recyclable materials, their collection from each of the schools, and transportation to the city of Santa Cruz. Within the past six months Ellena has also spearheaded an environmental awareness campaign through a series of print, radio, and TV advertisements. She has been involved in the creation of each advertisement in the idea process as well as the filming, and design. Currently, she is designing an environmental calendar for the entire municipality of Yacuiba. Its comprised of a series of drawings and poems by local students on contamination and images she has taken in Yacuiba and the surrounding countryside. The calendar is set to print in late November with a final estimate of over 5000 calendars for the municipality. Naya Villarreal has been an Integrated Education Volunteer in the Santa Cruz valley region since July 2006. Naya’s work partner is Jacquelin, the Director of the school. She is a strong, kind leader, with a good team of teachers and a commitment to providing new opportunities to her students. 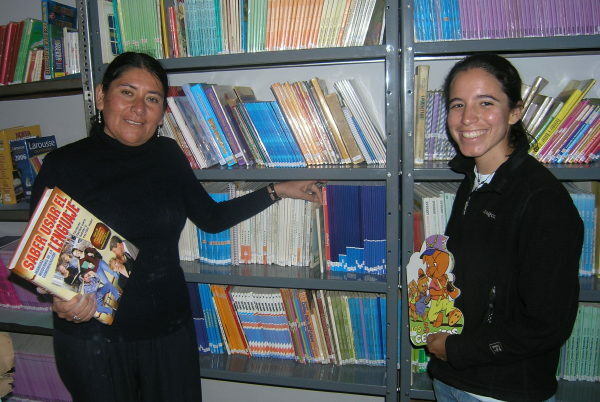 Upon arrival in Comarapa, Naya began work with the Sevilla School, her host agency, by collaborating with the teachers to sort and catalogue the books in their new library. Once the librarian was hired, Naya trained her in management of the library and how to encourage the teachers and students to utilize it. Naya also taught the librarian basic computer skills. At the Sevilla School Naya has a Reading Club with one of the 5th grade classes. Currently, the school is searching for funding to build cement chess tables. Once these are built, Naya will train the teachers to use the game as an interactive teaching tool, so they can organize and teach their students. Naya’s favorite part of her work in Peace Corps builds on her dedication to prevention of HIV/AIDS through education. She came to Bolivia with a great deal of experience and motivation after working in Tanzania in 2005. In Peace Corps she learned about Bolivia, its particular culture and needs. Here she has delighted in applying her knowledge and talents in the form of creating workshops with Bolivian professionals from the fields of health and education, replicating and adapting educational materials and presentations so that they are timely and well received in her community. Naya also works in Rio Arriba, a much smaller neighboring village that recently got electricity, where she supports the school with the antiquated computers they received, demonstrates her commitment to fitness during physical education classes, and promotes the use of their small library. There is a teacher in Rio Arriba who wants Naya’s help writing up a project to propose to the mayor’s office for a children’s hour on the local radio. Naya is well integrated into her site. She plays basketball for the teachers’ team and is their secret weapon. She also tutors 2 women in English a few nights a week and leads training sessions and activities with the newer Volunteers in her area. Naya is from Ventura, CA, and she has a BA in Political Science from UCLA. Mike McCaffrey was born in China, and raised in San Francisco. He attended UC Santa Cruz, double majored in Economics and Psychology, and studied International Business in Singapore for a semester. He graduated in 2003, and traveled around the world to places like India, Guatemala, and Mexico. His experiences catalyzed an interest in international development and led him to the Peace Corps. Mike served in the community of Maragua (Chuquisaca Department) which is an extremely rural farming community, where the population fluctuates seasonally, between 50 and 350 people. Transport was by a bus or truck out to an even smaller village, then he forged a river on foot, and hiked through the Andes for 12 kilometers. In the rainy season, the river was not crossable, and the alternative hike to his site took up to 6.5 hours. He lived in an abandoned kindergarten he fixed up during his first three months, without electricity, at 10,000ft, where it was too cold and barren to grow anything but corn, wheat and potatoes, and the people were too poor to eat meat except two or three times a year. Those who do venture a visit to Maragua are amazed by the Jalq’a weavings the women produce, the condors that sweep through the river beds, and are awestruck by the crashing waterfalls and hot springs scattered throughout the region. Mike worked directly with the community leaders in Maragua, and learned some basic Quechua. It was extremely challenging at times, but it gave him a unique perspective that forms a foundation for many of his current beliefs. He worked with indigenous weavers in his first year, focusing on: quality control, accounting, marketing, and the creation of a materials bank. In his second year, he concentrated on community tourism as a way to promote sales and extend benefits to the larger community. Some of these initiatives were: the first store in the history of the village, a small hostel where travelers could stay, guide training, administrative training, and creating venues for weavers to sell their handicrafts. In addition, Mike collaborated with the local school to build a kitchen (switching from firewood to natural gas stoves). As third year Project PCVL for MED, Mike has helped implement structural changes to the Microenterprise program, and to share the lessons he learned as a volunteer with those still in their sites. In his first six months, Mike focused on visiting and advising volunteers, and developing new sites for the incoming training group. Currently, he is actively involved with training for new group and putting together microfinance resources for Peace Corps Bolivia. In addition, Mike works for an NGO called Poverty in Action, which uses experimental techniques to evaluate the success rates of development projects. Presently, they are implementing a study at ProMujer, a microfinance institution which lends money to impoverished women. The goals are to improve their services, make their program more flexible, and increase their client base and client retention rates.